99 years ago a British force of 50,000 mainly Indian troops occupied the Ottoman city of Baghdad as part of the campaign in Mesopotamia. It took until September 1917 for the occupying forces to organise a postal system using seized Turkish stamps locally overprinted in a complicated process that required 3 operations. Examples of all of the stamps are rare, so we were very pleased to be able to offer a range of issues in our September auction, all of which are ex Saatchi. Fine examples of rare stamps can often surpass any estimates put on them and these did not disappoint. The pick of the items, a 1a on 20pa carmine, which was estimated at £3,500, sold for a staggering £17,100, even exceeding the SG catalogue value of £11,000. Similarly, an unissued 2a on 40pa Mosque achieved £10,030. 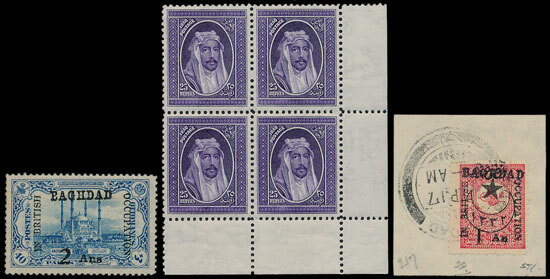 Also from the same source, an Iraq 1931 25r block of 4 sold for £5,430. 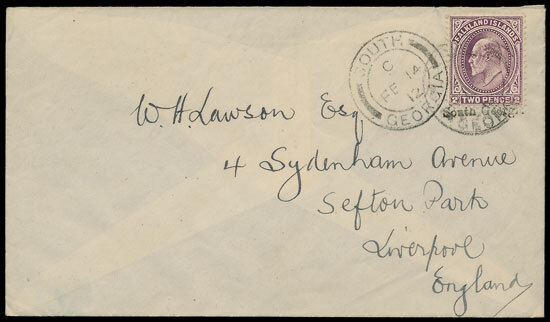 A tidy Falkland Islands cover to Liverpool with South Georgia cancel sold for £450. A very attractive range of Western Australia imperforate values attracted considerable interest. Described as ‘superb examples’ the lot sold for £1,530. In an article on our website (here) we asked ‘how much will a mounted mint China 1980 8f Monkey realise?’. The answer was £1,090. An extensive specialist Czechoslovakian collection in 22 binders, described as having ‘Exhibition potential’ sold for £17,700. Classics were once again in demand, with an 1840 1d black plate 1b selling for £295, over twice the estimate. An 1841 2d blue with ‘6 in MC’ cancel sold for £450, and another marginal example sold for £575. A very fine 1847-54 Embossed 10d corner marginal sold for £540. 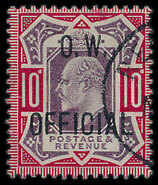 A rarely seen 1902-3 Office of Works 10d official overprint with RPS certificate sold for £2,480.